On his birth centenary, remembering Ustad Alla Rakha, the maestro who lifted the tabla from the margins of Hindustani classical music and placed it under the spotlight. It was the summer of love, and tens of thousands of what the American singer and songwriter Ottis Reading called the “love crowd”, had gathered at the County fair grounds in Monterey, California, in June 1967. On stage, sitar maestro Pandit Ravi Shankar was playing an evocative afternoon raga — Bhimpalasi — before an entranced audience. It was the third and final day of the annual Monterey Pop Festival, and English rock legend The Who, American guitar great Jimi Hendrix, and rock giants The Grateful Dead were slated to perform after. Towards the end of the concert, during the jhaala — the fast-paced conclusion of a raga, often characterised by melodic and rhythmic improvisations — Shankar looked to his right, at his accompanying tabla player, Ustad Alla Rakha Qureshi. Then, he stopped playing to let the sound of the complex web of rhythm rising from Rakha’s tabla reverberate across the ground. The audience roared in appreciation just as they would hours later when Hendrix smashed his guitar, or when Janis Joplin would give what is still counted as one of her best performances. Not just Ravi Shankar, Alla Rakha, too, was creating history that Sunday. Minutes into the jhaala, when he had needed to tune his tabla, he had hit the bayan (the left drum) with a small tuning hammer, including the sound as a beat syllable. There had also been the six-minute solo in ek taal before he wove magic with the teen taal — the 16-beat time cycle. Monterey Pop, a 1968 concert film by DA Pennebaker, gives a glimpse into the the extraordinary four-hour concert (when all other artistes were given 40-minute slots), where the complexity and rhythmic improvisation of two Indian maestros held the audience, including Hendrix, spellbound. By the time the concert ended with a jugalbandi and a trademark tihaai, Alla Rakha, a musician from Gurdaspur in Punjab, had managed to lift the tabla from an accompaniment to centre stage. 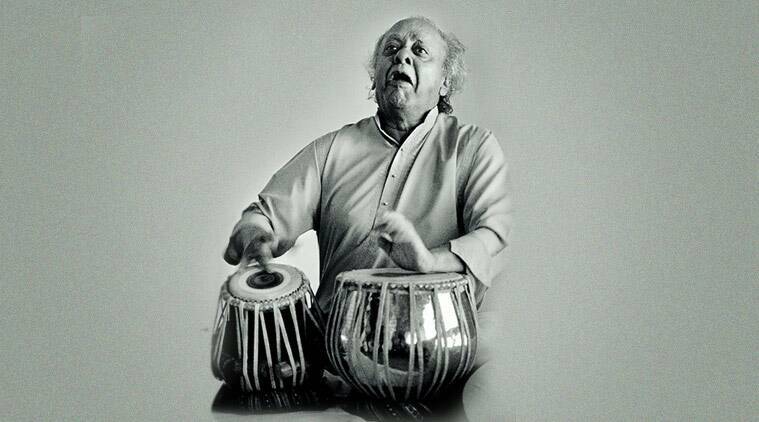 Alla Rakha Qureshi, one of the greatest tabla players of the century, would have turned 100 on April 29 this year. 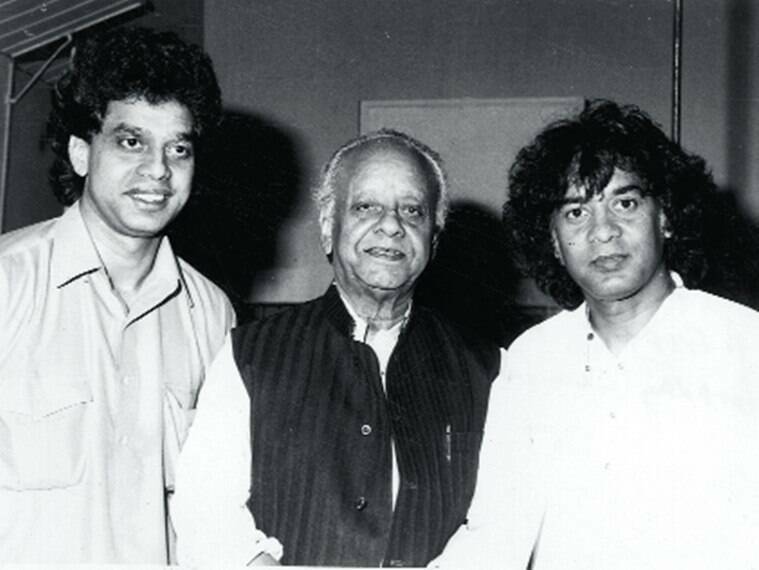 Tribute concerts spread over two days — April 28 and 29 — at NCPA, Nariman Point, by his three percussionist sons Zakir, Fazal and Taufiq, and a number of his students from across the world will be held to commemorate the occasion. “(The performance at) Monterey was followed by Woodstock in 1969 and the Concert for Bangladesh in 1971, all of them with Pandit Ravi Shankar. They really helped in putting the tabla on the world map. Later, Zakir (Hussain) bhai took forward his tradition beautifully,” says Taufiq Qureshi, 56, Alla Rakha’s youngest son. Alla Rakha with sons Fazal (left) & Zakir. Born to a soldier father, who later took to farming, and a homemaker mother in Ghagwal, a sleepy little village in Jammu, Alla Rakha was drawn to music around the age of 12, when he was visiting his uncle in Gurdaspur. His father was very fond of watching naatak, and, in Punjab, travelling troupes performed often. He’d take little Alla Rakha along, and the boy would listen for hours to the cyclical nature of the beat on the tabla. But music as a career was not the most obvious choice for his family. So Alla Rakha ran away from Jammu and began living in Gurdaspur with his uncle. But Gurdaspur was just a pitstop. He wanted to be in Lahore to learn from Mian Kader Baksh, a legend of the Punjab gharana, and, one day, the young Alla Rakha made the journey from Gurdaspur to Lahore. He was about 13 years old then. “He used to have dreams of a ‘saintly-looking’ man as a young kid. One day, he saw that man’s picture in the newspaper. He was Mian Kader Baksh of Punjab gharana. Alla Rakha decided to learn from him even if that needed him to run away,” says tabla player and Alla Rakha’s student Aditya Kalyanpur, 40. Tabla gharanas are different from vocal and other instrumental gharanas and rest on three broad principles: the technique; the style of composition (language/construction/phraseology of the tabla syllable in various compositions); and the individual philosophy of the great ustads of each school of thought. There are four gharanas of tabla — Punjab, Purab (also known as the Banaras gharana), Delhi, and Ajrara. The baaj (playing style) of the first two gharanas is more pakhawaj-based. While Purab is more suited to Kathak, in the Punjab gharana, pakhawaj-based phraseology mixes with tabla techniques and bols. Punjab also had offshoots or sub-gharanas like Talwandi and Naiwala. 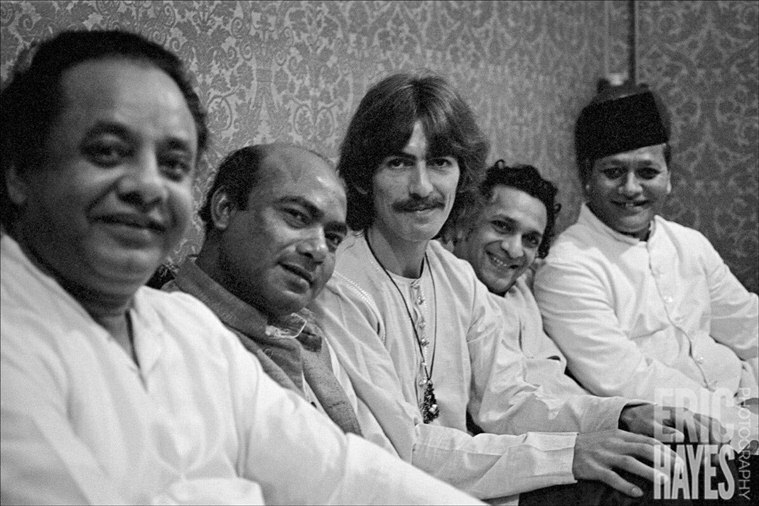 Alla Rakha with Ali Akbar Khan, George Harrison, Pt Ravi Shankar & Bismillah Khan. Mian Kader Baksh was a formidable and exacting guru. His instructions were clear: in winter, the student had to begin practising at 5 am, outside, just in a vest and a loin cloth, and continue till the vest was dripping with sweat. After this, Alla Rakha would go to work at a small dhaba, where he would bend over a stove and cook so that he was able to pay nazrana to his guru for giving him his education. A Dogri-speaking boy, he soon became fluent in Punjabi or Jhangi (Pakistani style of speaking the language). Alla Rakha also trained as a vocalist under the iconic Ustad Ashiq Ali Khan for 10 years. This training in various aspects of classical music helped him create new content in tabla compositions. “Abbaji contributed to so many aspects — right from the content — peshkaar (beginning of a solo that has strokes derived from the main theka), to the qaida (a rhythmic theme elaborated through mathematical improvisations) and gat among others. He self-composed and created a whole repertoire. He had a burning desire to contribute more to the Punjab gharana, and, in the process, added his own dimensions to it,” says Alla Rakha’s student of 23 years and an important name in the field, Yogesh Samsi. The tabla player from Delhi calls Alla Rakha a master of the rela — shorter, swifter strokes. 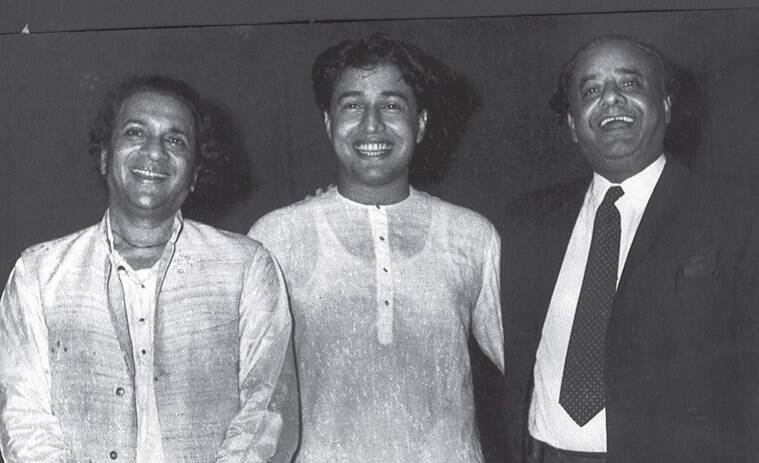 Alla Rakha with Pt Ravi Shankar. Sukanya Shankar, 64, Pandit Ravi Shankar’s wife, who met Alla Rakha in 1972 for the first time while rehearsing for Shankar and Alla Rakha’s Royal Albert Hall concert, says she was always touched by Alla Rakha’s child-like enthusiasm. “It’s not just showmanship or versatility or even virtuosity which makes a musician. It’s about not losing the core of music in your performances. Abbaji was unique. He and his tabla were one. There was no other option but to love him instantly. As a person, Abbaji, as he was fondly called by everyone, was kind, funny and very affectionate,” she says. A year older to her husband, Alla Rakha called him bhaiya and loved and respected him dearly. “They had such fun on stage,” she says. In 1940 in Lahore, Alla Rakha joined All India Radio as an accompanist. Soon after, he moved to Delhi, married Bavi Begum, and got a job with All India Radio, this time in Bombay. 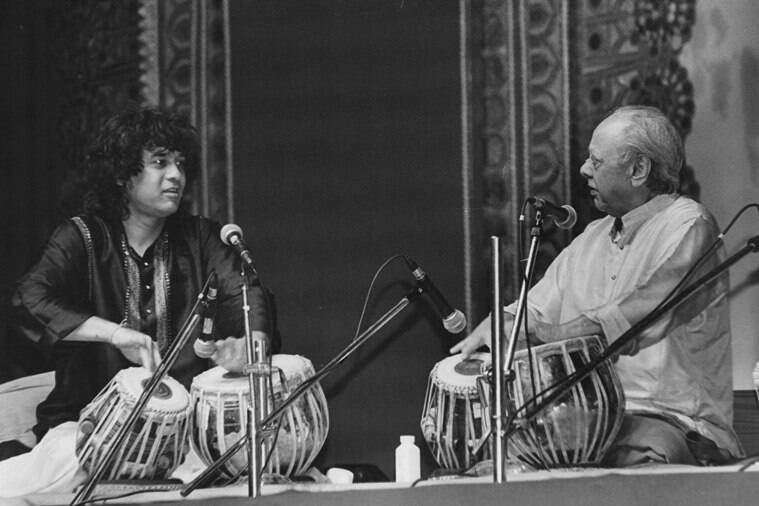 There, as the station’s first ever solo tabla player, he would meet Shankar for the first time. After three years at the AIR, Alla Rakha tried his hand at composing music. Working in films offered good money and fame and gave him an opportunity to put his musical knowledge to use. He worked in about 30 films under the name AR Qureshi. These films included the Raj Kapoor and Nargis-starrer Bewafa (1952), Maa Baap (1960) and Khandan (1965). Alla Rakha was friends with filmmaker K Asif — Zakir had even auditioned for the young Salim’s role in the blockbuster Mughal-e-Azam (1960), which was eventually played by Jalal Agha. Alla Rakha with Amjad Ali Khan & Shankar. By this time, Alla Rakha and Bavi Begum had moved to Mahim, a middle-class neighbourhood, where they lived in a one-room apartment behind the Mahim dargah. It was in this house that the couple had their two daughters — Khursheed and Razia. Zakir, their first son, was born in 1951, Fazal 10 years later, and Taufiq in 1962. The family would move to their Napean Sea Road apartment in 1970. Alla Rakha was also married to Zeenat Begum from Pakistan and had two children with her. In the ’50s and ’60s, accompanying artistes did not enjoy much of a social stature. The names of musicians did not appear on records or posters and they were paid much less than the main artiste. Tabla players were even made to sit behind the main performer. The word tabalchi was used in a rather derogatory manner. That did not deter Allah Rakha. In the mid ’60s, he decided to concentrate solely on classical music. 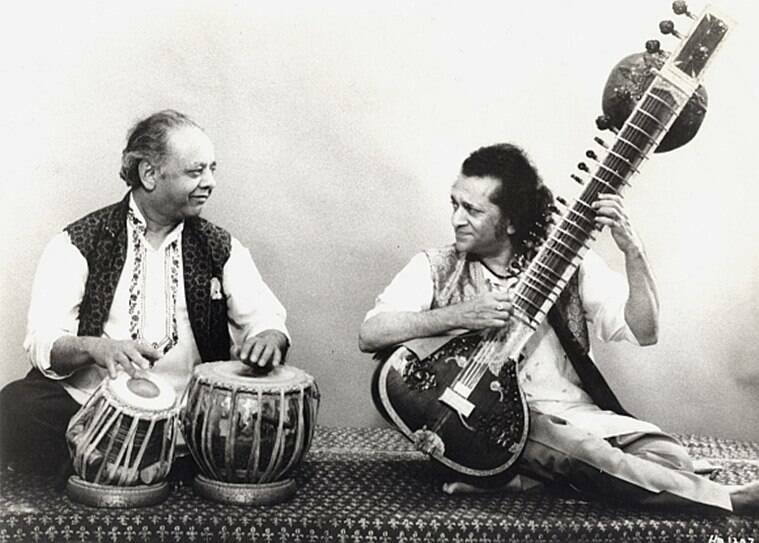 He began accompanying artistes such as sarod maestro Ustad Amjad Ali Khan’s father Hafiz Ali Khan, Bade Ghulam Ali Khan, and, of course, Shankar, with whom he worked extensively. The two travelled together, and Shankar, who was fluent in English, began explaining Indian classical music to the western audience. In his explanation of the concepts of rhythm, Alla Rakha’s brilliance was highlighted often. “He (Shankar) was the first musician who put his instrument down (at a concert), gave taal and let the tabla player take off. He wanted the world to know the importance and beauty of tabla. In fact, he was criticised at times because he gave it too much importance,” says Sukanya. If the Beatle George Harrison and Yehudi Menuhin, one of the greatest violinists of the 20th century, were awed by Alla Rakha’s rhythm, legendary drummer Mickey Hart of the Grateful Dead called Alla Rakha the “Einstein of rhythm” and his technique, the “highest form of rhythmic development on this planet”. He had watched a recording of the Monterey concert and was amazed. Writer Peter Lavezolli wrote in The Dawn of Indian Music in the West (2007, Continuum Books), “It was a life changing experience for Hart… Mickey could not believe that one person was capable of such an intricate web of polyrhythms and repeatedly checked the liner notes of the LP to make sure there wasn’t a misprint. Once he accepted that it was one drummer, he was confounded by the dizzying complexity of Indian rhythm.” He would later create a piece called Eleven with his band The Grateful Dead. Not many knew it was a tribute to ek taal — and to Alla Rakha. 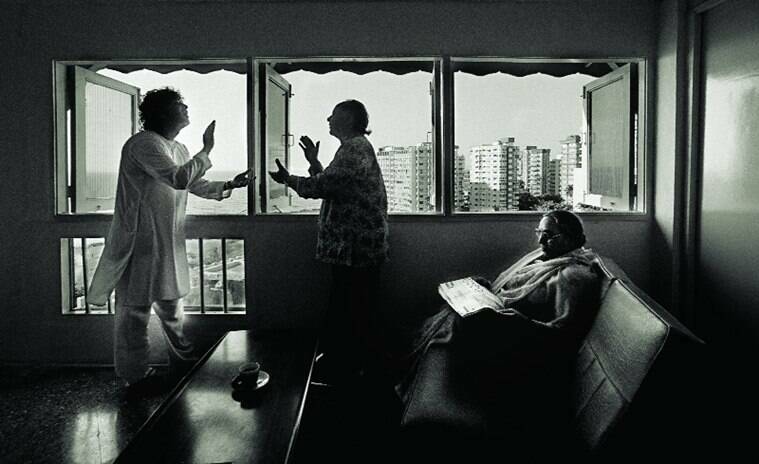 Alla Rakha with son Zakir Hussain and wife Bavi Begum at their Mumbai residence, shot by Raghu Rai for his 2010 book, India’s Great Masters: A Photographic Journey. When Zakir was born, the story goes that Alla Rakha whispered tabla bols in his son’s ears instead of verses from the Quran. When his wife asked him why, Alla Rakha’s answer was simple. “He said that tabla bols were as close to ibaadat as it got for him,” Zakir had told this reporter in an earlier interview. As the eldest son, the onus of carrying forward their father’s legacy fell on Zakir, who showed a natural affinity for the instrument. 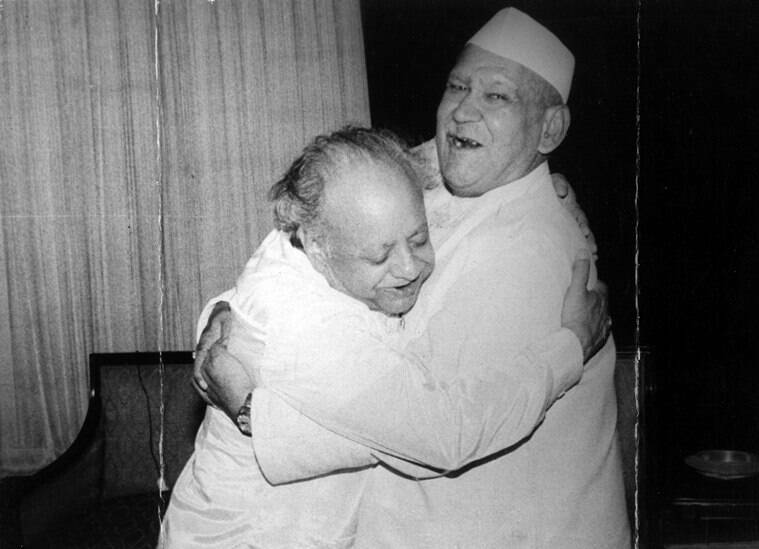 The two also shared a close bond. “I used to stay up late in the night and refused to sleep until he came home,” says Zakir in Zakir Hussain: A Life in Music (2018, HarperCollins). Alla Rakha would cook for the children often. Once, on his birthday, Taufiq remembers not receiving a gift from him. “When I asked him why, he said he was making one. He created a nine-beat, complex chakradhar for me because my birthday falls on the 9th,” says Taufiq. To his children, he was a loving father, a demanding guru, and the fulcrum of their lives, to his peers an exceptional artiste, and, to his students, he was simply god. “Only god loves you like that. For him, his students were his sons and his sons his students. You never saw any difference,” says Kalyanpur. “Whenever you saw him, he was busy creating compositions. There was always music and just that only,” says Alla Rakha’s only woman student, Anuradha Pal. A gentle teacher, Alla Rakha was, however, demanding about riyaaz. But Bavi Begum was clear that the children had to get an education to prepare them for life. “My mother didn’t wear the burqa and my father never forced any of us to play the tabla. He made his daughters get an education at a time when it wasn’t the norm. He was quite unconventional for his time,” says Fazal. But, in everything, tabla and rhythm were sacrosanct. “He would lie on his side…and talk while tapping rhythms on his knee. I’d massage his arms…and he would quietly fall asleep. But Abba’s fingers would still be moving — he was still at the concert or in the moment when something good was happening,” writes Zakir in A Life in Music. The only time he slapped Zakir was when the latter broke a finger while playing cricket. In the last two decades of his life, Alla Rakha performed less, concentrating on teaching his students and working on messages of national integration for Lok Sewa Sanchaar. He passed away on February 3, 2000, when he was 80, just a few hours after his daughter Razia died following a failed cataract surgery. The three brothers were in Coimbatore for a concert at the time. “Abbaji was unique. I can hear his gusty laugh and the sound of his tabla even now. I am sure Raviji and he are having great fun and entertaining the gods,” says Sukanya. They must be playing Bhimpalasi. Raghu Rai on shooting Alla Rakha and Zakir Hussain for his book. For my book India’s Great Masters, A Photographic Journey (Harper Collins, 2010 ), I would meet artistes in Delhi and photograph them on stage, in concerts, backstage, so most, except Kishori Amonkar, were very welcoming and comfortable with my presence. And then the question came — how to go about capturing Alla Rakha, the daadu of tabla, and his son Zakir, also very prolific and flamboyant? So I went to their home and realised that I should shoot them together. (When I met him), Zakir was a young fun guy. He would create all kinds of rhythms — from his throat, from his hands, from his fingers. Alla Rakha sahab was the mature performer. He didn’t need time to warm up. His expressions and responses were as beautiful and vibrant as Zakir’s. He was unassuming, ordinary and a wonderful human being and that is what made him so unique.